When you’re out hunting, you don’t want to be seen, otherwise you’ll scare your prey away. There’s a lot of different tools that can help you hide away, including camo suits, treestands, etc. However, the hunting tool that has the perfect balance of effectiveness and ease of use is the hunting blind and in this article we’re going to cover the best pop-up hunting blinds out there. Hunting blinds allow you to hide behind a camouflaged surface that hides your presence from everything in the woods, including deer, turkeys, and more! And the best part is, they’re incredibly easy to set up now, thanks to new “Pop-up” technology that allows the blind to be set up and used in seconds. To help you find the perfect hunting blind for your budget and needs, we’ve assembled this list of our picks for the best pop-up hunting blinds on the market right now. To help you do your own research, we’ve organized the blinds into three different price ranges and given a short description of what to expect from each range. In addition, we’ve provided a list of specs that will allow you to easily compare each blind. This list isn’t exhaustive by any means, but should serve as a jumping-off point to help you find the best blind for your budget and particular preferences. Number of windows: Blinds would be pretty useless if they didn’t have windows; how would you shoot otherwise? If your target moves when you shoot, you want to be able to quickly adjust your position and follow it with your gun or bow. This is why, generally, the more windows you have the better. However, if you have one very large window, that can be even better, which is why you should pay attention to the next spec. Width of window(s): Some of the best pop-up hunting blinds only have one window, but that one window will offer a 180 degree view, allowing you to keep an eye on your target at all times. Depending on your preference (and budget), you’ll want to get a blind with either more windows or larger ones. Number of people that fit in the blind: Are you a lone hunter? Then you probably won’t need to worry about this stat. However, if you like hunting in pairs or larger groups, you’ll want to get a blind that will fit all of you, which many in the budget range won’t, unfortunately. These blinds are on the smaller end. Though you might be able to fit two people into one of these, it won’t be comfortable and will probably be detrimental to the hunt. But if you’re a long hunter, this is a great range to look in. Though these blinds are budget, they offer a lot of great features. You’ll see a lot more windows on these, rather than the single large windows. First on our list is this great budget blind. This one is a breeze to pop up, to the point where it’ll probably take you more time to put the stakes in the ground than to set up the tent itself. The inside is great; the walls are blacked-out, making it easy to focus on the view outside. Unfortunately, there’s no window on the back, but you can leave the door open to see outside if you want. 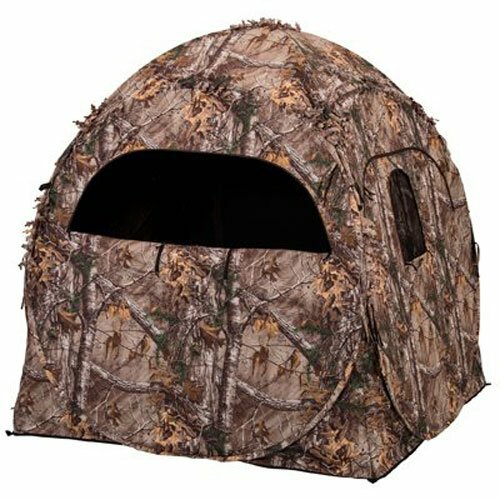 If you don’t mind being a little bit cramped, you can probably fit two adults in this blind; however, you might not want to both use rifles, since they can make the space even more cramped. The windows are attached with a button-loop system, which can take some getting used to. Once you do, though, it works wonders, since it’s incredibly quiet and easy to reattach. If you’re looking for a cheap blind that will deliver, this could be a great one for you. 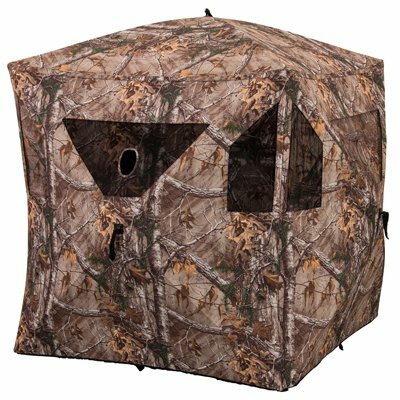 In terms of getting value for a low cost, this is one of the best pop-up hunting blinds you can find. This is yet another great budget blind. Called the “Doghouse” because of its compact nature, it’s probably not the best for more than one hunter. Of course, you can try yourself, just be prepared to be a little cramped. The windows open in any direction, which allows the the 270 degree view you already have to be adjusted any way you see fit. Unfortunately, this blind is not completely waterproof. However, it will keep you dry in a light rain. At 68 inches tall, this blind is very comfortable, and can easily be stood up in if need be. Like most blinds in this range, it has no floor, so if your area has dangerous snakes, you might want to be careful. The door is large enough to fit a wheelchair, which makes it easy to bring whatever you want into the blind with you. If you’re on a budget, take a look at this blind; you won’t be disappointed. This range is where you start seeing some cool extra features that the budget blinds just don’t have. Also, you’ll probably begin to see one large window instead of 2 or 3 small ones. This blind is part of the same series as the “Doghouse” (DH), but better in almost every way (hence the higher price tag. First off, the material on the Brickhouse is much more sturdy and thick, and will no doubt stand up to the elements much better. Though the Brickhouse is about the same size as the DH, its walls slant outward rather than inward, which makes it much more roomy than the DH. You can easily fit two large guys in the Brickhouse, with plenty of room to spare for gear and other things. The Brickhouse is also rounder, making it feel more homey, a good feeling when you’re sitting in the woods for hours on end. You can also adjust the windows on the Brickhouse silently, thanks to the elastic zip ties attached to each window on the inside. There is velcro as well, but it’s on the outside, meaning you can further adjust the windows whenever you please. Be careful though, moving the velcro will likely scare off any wildlife for a moment. The Brickhouse comes with 4 inch ports on every side that are perfect for fitting a camera, gun, or bow, in addition to the 360 degree view that you get from the windows. The Brickhouse also comes with scent control fabric, which will make you completely undetectable to any creature outside your hideaway. 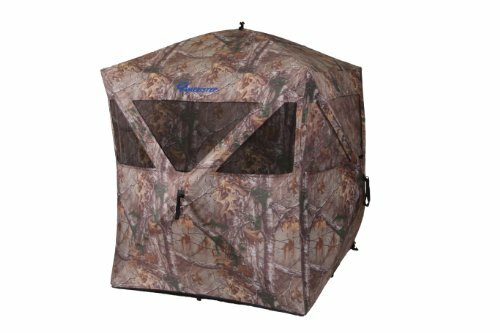 If you’re willing to spend slightly more in order to get more, the “Brickhouse” could be one of the best pop-up hunting blinds for you. These are the best blinds around. As such, they deliver everything you’ll want and more, as long as you’re willing to pay top dollar. When you do, though, you’ll be getting the best pop-up hunting blinds on the market. This blind looks like a strange, minimalist artwork, with its single window opening and closing at its owner’s whim. If that sounds appealing, you might want to take a look at this blind. As we just said, this blind has a single window that stretches all the way around to the door at the back, giving you a 180 degree view almost every way you look. The window is adjustable at every point, and can be adjusted between 0 and 20 inches. The door itself is zipperless, allowing you to enter completely silently if need be. 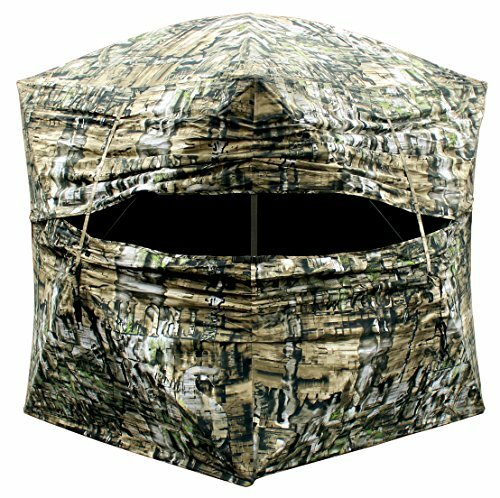 This blind is also incredibly solid, and comes with a lifetime guarantee, meaning it should last you decades, making it one of the best pop-up hunting blinds on the market today. If you’re willing to sink in a little dough to get a great piece of tech, this could be the blind for you. Which are the Best Pop-Up Hunting Blinds? At the end of the day, the best pop-up hunting blinds for you are the ones that best suit your budget and hunting needs. Just like many products, you get what you pay for. So if you want a blind made of a durable material that has multiple large windows and houses multiple people, you will want to go with the more expensive versions that have more features.